With the help of Sintratec Central you can manage your print jobs. 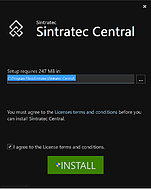 You can download, install and get to learn the Sintratec Central even before receiving your Sintratec machine. Install the Software by running the downloaded file. You don’t need to worry about updates. As long as you have a working internet connection, Sintratec Central and your printer will always be up to date. If you are using a computer with internet restrictions, make sure to check download page for new versions. Please read the following software manual before you start with your first print. 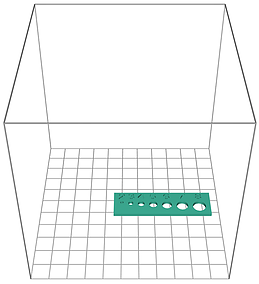 Especially note the positioning tips and parameter explanations for best printing results. The toolbar is used to import/export 3D print files/jobs and to get help. Green bar indicates active tab. 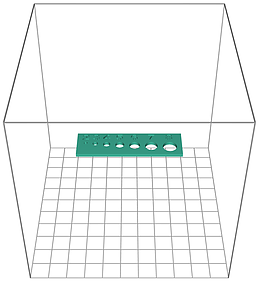 In the first tab you can load 3D print files into Sintratec Central and arrange them in the print volume (position, position, rotate, and scale). Before being able to position the 3D files you need to load them into Sintratec Central. Open Sintratec Central and either click File > Add STL file or Drag & Drop the 3D files into the main user area. As soon as the first 3D files is loaded into the software the main user area changes and the build volume with its boundaries pops up. You can either use your mouse to view the build volume or you can use the arrows in the top left corner to change the view of the build volume to a side view or a top view. If you use your mouse, you can rotate the view by holding the right button, pan by holding the middle button and zoom in/out by using the mouse wheel. The “Front” label always indicates the front side of the build volume, i.e. the front side of the printer. You can simultaneously hold x, y or z to move the object along the corresponding axis. There are three main positioning operations which can be applied to each 3D file; translation, rotation and scaling. 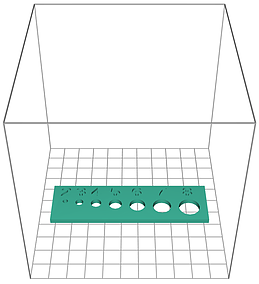 You can translate a 3D file in all three dimensions either manually with your mouse or by entering the values directly in the according fields. To translate the 3D file manually you can click and hold the left mouse button on the 3D file and move the mouse in the X or Y dimension. If you press and hold SHIFT while manually translating the 3D file, the speed of the movement is reduced allowing to position the 3D file more accurately. You can enter values in the translation fields to translate the 3D file more accurately. You additionally can press and hold the X, Y or Z key on your keyboard while moving your mouse to restrict translation in the according dimension. 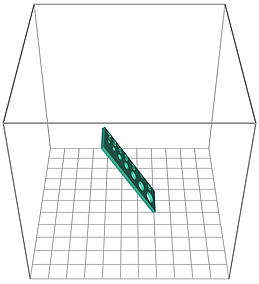 You can rotate a 3D file in all three dimensions by entering the values directly into the according fields. 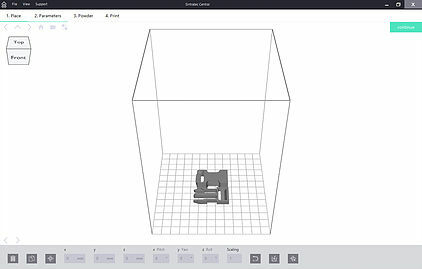 You can scale a 3D file in all three dimensions with the aspect ratio either locked or unlocked. 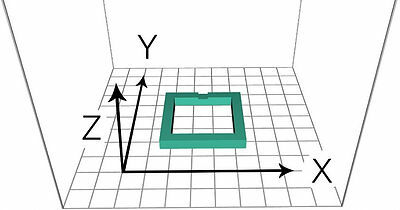 The 3D part properties are best when printed in the centre of the print area. The closer you position your 3D file to the border and corners of the print area the weaker the 3D parts. Also the risk of curling will increase when printing too close to the borders and corners of the print area. If you want to print fast, you should keep the height of the print job as small as possible. Because the layer change takes most time, your print job will be printed more quickly with few layers. Every layer that is already sintered has influence on the powder surface because of its stored thermal energy. Large fully sintered areas carry significantly more thermal energy than loose powder. Therefore, you should try to distribute large solid parts of your 3D files equally in the build volume to get more constant layer properties. put the large area into the z-dimension to keep surface finish but with the drawback of increased printing times. If a large continuously sintered cross section belongs to a flat part, it is even more prone to curling and warping. Best practice is to put the large area flat into the z-dimension to keep surface finish but with the drawback of increased printing times. To get the best possible minimum wall thickness, put the wall thickness in the z-dimension. 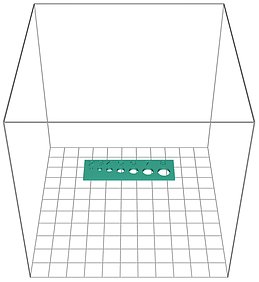 In the second tab you can set the parameters and prepare the 3D print file(s) for printing (i.e. the 3D print file(s) get sliced into individual print layers). You can choose between the different Sintratec powders. Select the powder you’re using and the quality you want. Choose show preview to see the slicing and the individual layers in a “preview” tab. 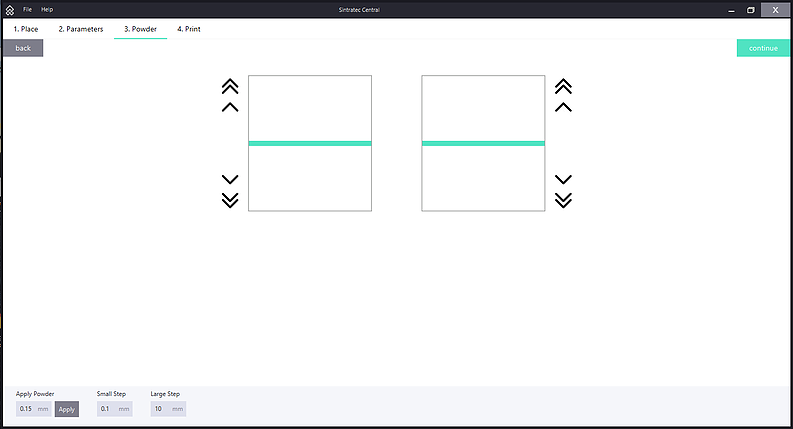 In the third tab you can control the left and right platform and the coater. You can set the distances the platforms will travel when controlled and apply powder layers of custom height. In the fourth tab you can control the printing process. Heats up your Sintratec printer. Click “Stop heat up” to stop the heating. If you start the print, your printer will automatically start to heat up. Starts the printing process of your Sintratec printer. The printer will heat up and then preparing the printing surface. The “Surface Temperature” Graph shows the current temperature on the powder surface of your Sintratec printer. and “Chamber Temperature” Graph shows the current temperature on the inside of your Sintratec printer. Opens the submenu to calibrate the laser. This section explains the Software during the printing process. Please read „Printing“ to learn more about the printing process. When you start the printing process, the print file will be transferred to your Sintratec printer. After the print file is transferred, the printer will start/continue heating up. Heat-up your printer by pressing the “Heat Up” button. Heating-up usually takes about 1-2 hours. 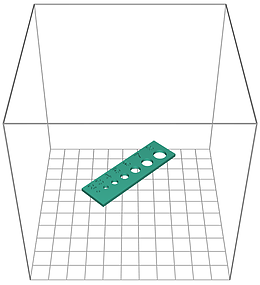 The get the best quality 3D parts the printer needs to have a homogeneous temperature distribution inside which takes time. You can skip the heating up with “Skip Heat Up”. We don’t recommend to skip the heating up. When your Sintratec printer is successfully heated up, the printer will prepare the powder bed. You can also skip this step by clicking “Force start scanning”. We don’t recommend to skip the powder preparation. The print will now start. You can follow the printing process. If you like to end the print early you can click on “Skip to cooldown”. 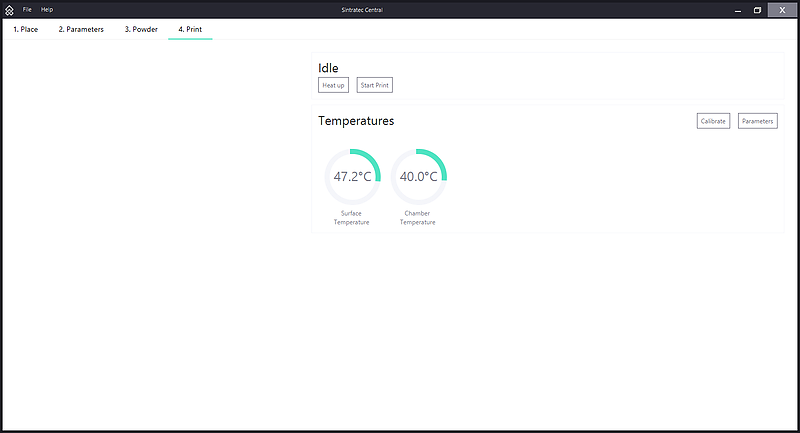 In the Parameters menu you can change the heat up temperature, print temperature and the laser speed of your Sintratec printer. In the calibrate menu you can calibrate your laser. 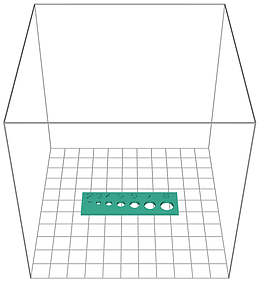 To calibrate your laser, you need the Calibration Pattern printed with you 2D printer. 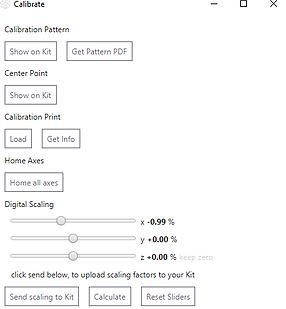 You can get a PDF with the calibration pattern by clicking on “Get Pattern PDF”. For calibrating the Sintratec Kit, please read the guide “Initial Commissioning” for details about the calibration. The Pattern is just for rough calibration. 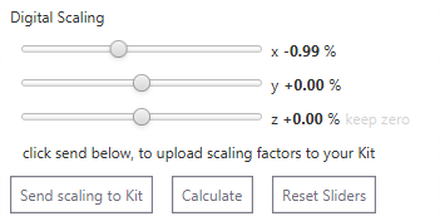 You can tweak up 5% in the Software with the function “Digital Scaling”. You can do the fine-tuning without calibrating the printer again. 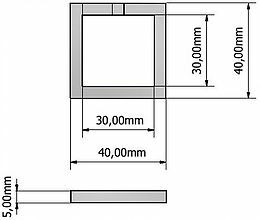 In the example above the measured part size in x-direction is 40.4 mm when it should have been 40 mm. If the other dimensions also vary, fill the values in, otherwise leave them at initial value 1. 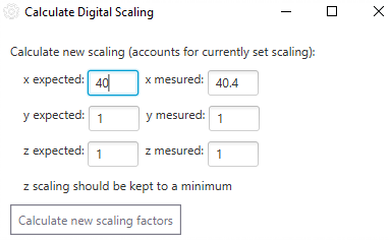 Confirm by clicking „Calculate new scaling factors“.